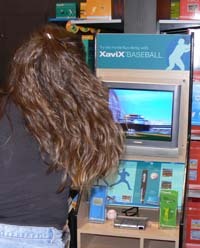 There was so much at the XaviX booth that I wasn’t able to try it all out, but I DID get to play with XaviX Baseball. 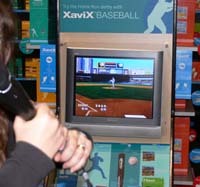 The game comes with the Baseball game cartridge, a short bat, and an electronic ball to pitch. It’s available for $49.99 at the XaviX Webstore. 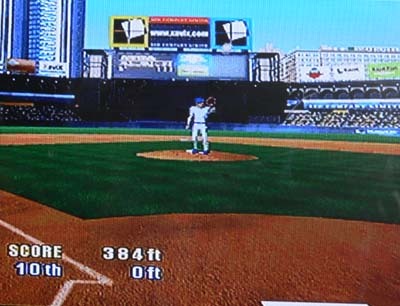 The cool thing about this game is that it can be two-player, where one person can bat while the other pitches. The uncool thing about it is that it’s not aerobic at all. I barely made it into the light intensity range, so this game is just for fun and barely at that. When I saw this game, I had fantasies about being able to play this and “practice” during the winter for softball, but after playing with it for a little bit, my hopes were dashed. The bat is a little small and doesn’t feel like a real baseball bat. Considering my clumsiness, that can be a good thing, but it does nothing to develop my muscles for the softball season. Additionally, the physics of this game are off. When I tried to swing for a ball at the time when the ball would be over the plate in the “real” world, I struck out each time. I had to swing far earlier to hit the ball in the XaviX world. It only took me about five or six times to understand the new physics, but if I thought that playing with this game might help me a better player in the real world. I was sadly mistaken. Still, it was fun to play. I could play it against a friend or play it alone. I could pitch or bat. After playing softball for a season, I KNOW that I didn’t hit that ball hard enough to get it out of the park, but that didn’t stop it from feeling really good when it congratulated me on my home run. If you’re looking for a workout, this isn’t your game. If you’re looking to increase your baseball or softball skills, this also isn’t your game. If you just want to have fun playing imaginary baseball, then this is the game for you.